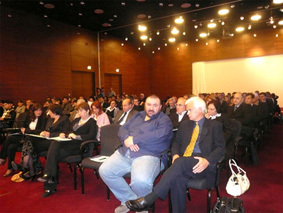 X International User Conference of Geoinformation Systems and Remote Sensing was held on 9 October 2009 in Tbilisi. Unlike previous conferences this year conference lasted only one day though the number of speakers and attendees gave evidence to the fact that the conference was informative and interesting. “GeoGraphic” opened the Conference by summarizing the results of 10-year activities. The foreign and local partners presented projects implemented in GIS environment and illustrative examples of geo-technologies application. 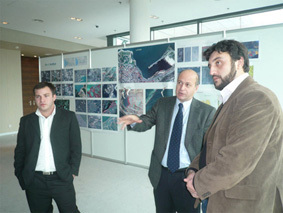 The visit of Mr. Wojtek Gawecki from ESRI and his keynote speech about ESRI status and direction was of a great interest. Colleagues from Armenia (GeoCom) and Georgia (Association of Landowners Rights Protection, GeoLand, Idea Design Group, GIS-Lab), local partners and users (National Agency of Public Registry, National Agency for Cultural Heritage of Georgia, Seismic Monitoring Center) reviewed advantages of geo-technologies establishment and emphasized the importance of GIS application in the projects of different fields. The Conference addressed in details the projects in urban planning, cultural heritage preservation, environmental protection and seismic analysis. The integral part of the Conference was an exhibition displaying cartographic and aerial survey materials produced during the implementation of different GIS projects by “GeoGraphic”. Company “GeoLand” also participated in the exhibition. Annual International User Conferences of Geoinformation Systems and Remote Sensing held by “GeoGraphic” helps the wide public to get acquainted with capabilities of geo-technologies and give the opportunity to the participants to establish partnership and collaborative relations.